A-Mazing Post Pounding is the sixth level of World 3 in Yoshi's Woolly World. The level opens with a pitfall with one Fang at the top. After the pitfall, Yoshi must ground pound the posts blocking the door, then enter the door. Yoshi enters a room with many posts. Yoshi should pound either the yellow post or the purple post to continue to the next room, then trigger the secret Winged Cloud to touch the first checkpoint. Afterwards, Yoshi must use the spring-like posts to advance directly to the second checkpoint. Afterwards, Yoshi must hit a hidden Winged Cloud by flutter jumping to the left of the ledge, revealing a platform to an edible wall. Eating this wall and activating the trampoline-like post will send Yoshi to another part of the maze, where Yoshi can repass the first checkpoint. Afterwards, Yoshi should return to the ledge containing the second checkpoint, where a Present Box containing a key awaits. Yoshi must then pound the nearby pink post and eat the edible wall to enter the Whirly Gate, transforming him into Mole Yoshi. After the transformation segment, Yoshi must go to the left, then pound the post to spring up and open the locked door. Yoshi must then pound the last post to leave the area and get to the goal roulette. Smiley Flower 1: Behind an edible wall just below the fourth Smiley Flower. Smiley Flower 2: When in the room with the trampoline-like posts, Yoshi must pound the rightmost purple post, then move the right wall and throw a yarn ball at the Winged Cloud to unveil the Smiley Flower. Smiley Flower 3: When Yoshi approaches the second checkpoint, he must eat an edible wall just above, then enter a door. Inside the secret area, Yoshi must continuously jump off of Fangs to reach the Smiley Flower. Smiley Flower 4: In the same room as the first checkpoint, guarded by a Piranha Plant. Smiley Flower 5: After getting bounced from pounding the last post, Yoshi must touch the exclamation circle, then follow the trail of beads down to the Smiley Flower. Wonder Wool 1: After the pitfall at the start of the level, Yoshi must push the left wall and throw a yarn ball (from eating the Fang) at the Winged Cloud to unveil the Wonder Wool. Wonder Wool 2: Yoshi must ground pound the second purple post to be led directly to the Wonder Wool. Wonder Wool 3: Surrounded by sponge dirt near the end of the Mole Yoshi segment. Wonder Wool 4: Immediately after the Mole Yoshi segment, up above some Fangs. Wonder Wool 5: At the room to the left of the Whirly Gate exit, Yoshi must pound the post to bounce up and collect the Wonder Wool. 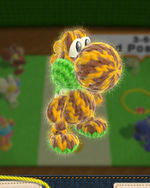 Collecting all of the Wonder Wools knits Pound Post Yoshi back together. During the level there is a Whirly Gate segment featuring Mole Yoshi. This segment, when completed, cannot be reentered. This page was last edited on February 25, 2019, at 21:38.